Intel has presented the latest Xeon Phi processors, which carry the Knights Landing code name. Unlike earlier models, the new Knights Landing processors can handle all kinds of tasks. 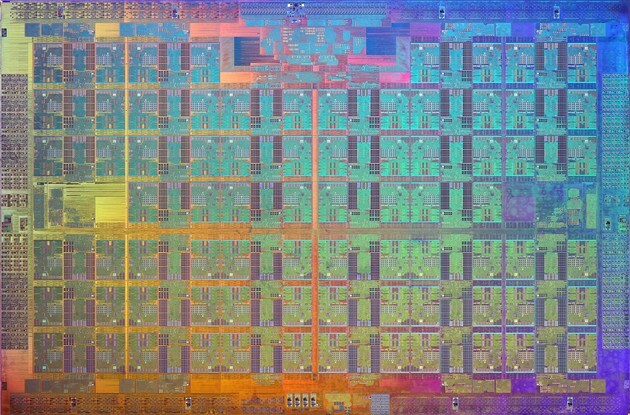 There are four new Xeon Phi processors – the 7210, 7230, 7250 and 7290. They are all based on Airmont processing cores and can contain 64-72 cores depending on the model. The new chips support Hyper-Threading technology but unlike desktop processors each Airmont core can take up to 4 threads at once, which means that the Xeon Phi 7290 can handle up to 288 threads at once thanks to its 72 cores. Thus the chip can reach up to 3 TFLOPs of performance. Now we will share more details on these interesting processors – the Xeon Phi 7210 and 7230 have 64 cores that run at 1.3 GHz, TDP levels of 215W and 16 GB of integrated MCDRAM memory. In addition to this these two chips have 6-channeled DDR4 memory controllers for up to 384 GB of RAM, but the 7210 model works only with DDR4-2133 and uses a 6.4 GT/sec of memory bus speed, while the 7320 model works with DDR4-2400 and offers 7.2 GT/sec of memory bus speed. The Xeon Phi 7250 features 68 processing cores at 1.4 GHz and the same specs as in the 7230 model. The Xeon Phi 7290 is obviously the fastest chip among the four – this one features 72 cores at 1.5 GHz, and a TDP level of 245W. All the remaining specs are the same as in the 7250 model. Each processor is made of 8 billion transistors, which is simply impressive. The new Intel processors are, however, expensive – the Xeon Phi 7210 costs USD 2438, while the 7230, 7250 and 7290 models sell for USD 3710, USD 4876 and USD 6254, respectively.